Apart from the Class and Interface, Enumeration type or Enum is another popular type in Java programming language. Enum allows you to represent a fixed number of well-known things in a type-safe manner e.g. days of the week, days of the month, planets in solar system, buttons on remote control, keys on keyboard and suits on playing cards. Before Enum was introduced, prior to Java 1.5, integer and string constants are used to represent the fixed number of things, known as enum int pattern and enum string pattern as described in classic Effective Java by none other than Joshua Bloch. Though they served the purpose, they had some major drawbacks which resulted in poor quality code. One of the major issues was type-safety i.e. you cannot restrict them to represent a fixed number of values e.g. an integer constant, which is representing days of the week can have value as 100, which is incorrect, given we have only 7 days in a week. These limitations are addressed by providing enum type, which guarantees that only correct and fixed number of values can be assigned to them. The good thing about Enum in Java is that they are feature rich, the bad thing is that they are still under-used and many developers don't even know about Enumeration type in detail. Though there is a lot of blog post about different features of Enum in Java, and their usage, there is hardly any page, which provides a good look at key points about Enum. It doesn't mean to be comprehensive but at-least provides those lesser known details. I had previously shared some features in form of question-answer on my article 15 Java Enum Interview Questions and in this post, we will learn more about Enum in Java in this article. I have kept the explanation short and to the point to it may look like a summary and notes than a tutorial, but can be very useful to quickly get up-to-speed with Enum type in Java. 1. Enum is constants in Java. They are implicitly declared public, static and final. Since they are constant, there is no way you can change them. 2. All enumeration type implicitly extends from java.lang.Enum class internally. Which means Enums are internally represented as a class type. Furthermore, enum constants are instances of the enumeration class. 3. Since all Enum type extends java.lang.Enum, they cannot extend any other class in Java, as multiple inheritances are not allowed in Java, and a class can only extend one class. This property has not changed even with the introduction of default or defender methods in Java 8, which allows you to declare non-abstract methods in the interface. 4. Enum can implement an interface in Java, which is also a way to extend enum type. When an Enum extend an interface, each of their instance implement interface method in their own way or you can provide a default implementation under Enum class itself. Take a look at this example, it's not the best but at-least demonstrate how to implement interface inside enum in Java. You can see that EnumThread, which is an enum actually implements Runnable interface and also overrides run() method. This proves that enumeration type cannot only implement an interface but also can override methods in Java. 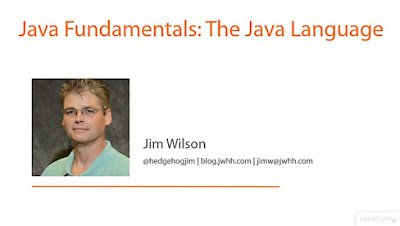 See Java Fundamentals: The Java Language to learn more about it. 5. An Enum class can have a constructor but it can only be private. You cannot make it public because Enum instances are supposed to be created at compile time and from the class itself. A non-private Enum constructor with any modifier other than private is a compile-time error in Java. Though a constructor without any access modifier is also allowed. Similarly, you can also overload constructor inside Enum, as shown below, by the way, don't forget to declare enum constants or; before declaring constructors, you can also see this post to learn more about Enum constructor in Java. 6. The java.lang.Enum defines several useful methods, which is available to all enumeration type in Java. You can use name() method to get the name of any Enum constants. String literal used to write enum constants are their name. In this code snippet, valueOf() method returns an Enum constant Gender.MALE, calling name on that returns "MALE". 7. There are two ways to compare enum constants in Java, you can either use equals() method or simply == operator. There are some advantages of using == operator over equals, as it provides type-safety and also avoids potential NullPointerException if the enum on which you are calling equals() is null. You can see more details about comparing two Enums in Java here. 8. Enum constants cannot be cloned in Java. An attempt to make a clone of Enum constants will throw CloneNotSupportedException. You can clearly say that we are using an enum variable inside the switch() block to decision making, and we are also using enum constants in case statements. 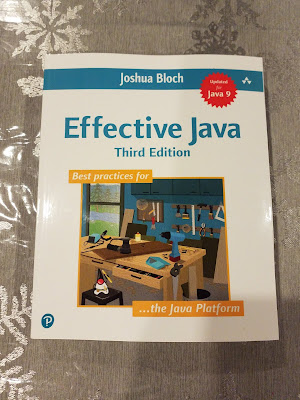 You can further see Effective Java 3rd Edition to learn more about more advanced and effective use of Enum like this. 10. When you declare an Enum type inside a class, it is by default static. You can see that from above example that, we can access OS Enum type as SmartPhone.OS, which is like accessing a static member of any class. 11. The new() operator is not permitted to be used with enum, not even inside enum itself. This is because, Enum constants are fixed, and no instance of an enum can be created at runtime. 12. Like any other class, you can also override toString() method for any Enum type. By default toString() method returns the name of Enum constants and its output is same as of name() method, but you can override it to provide more information. 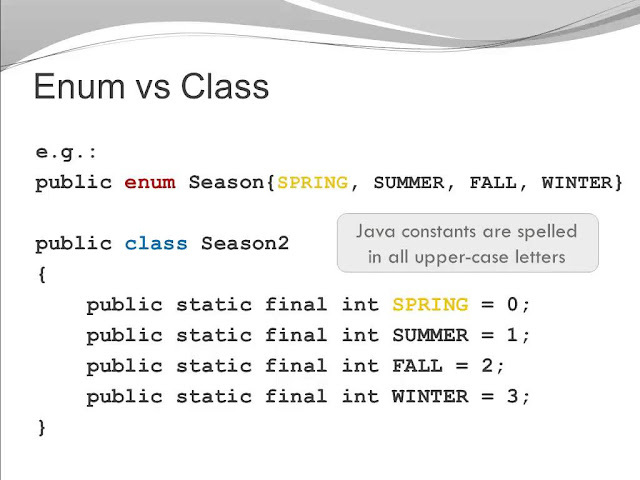 That's all about Enum in Java. I hope this detail helps you to understand Enumeration type in Java. It's one of the fundamental concept, which you can't afford to overlook. Since I have used Java even before enumeration type exists, I can say that enum helps you to write robust and clean code in Java.